Why work hard even on your days off? Traditionally in Australia people have been led to believe that cutting their own lawn was the best option. Strangely enough there is proper evidence now that not only is it better and safer for someone else to do your lawn mowing and gardening. Experienced lawn mowing experts can do the work faster and more efficiently. What will surprise you though is the pricing. Its affordable and your grass will love you over time. 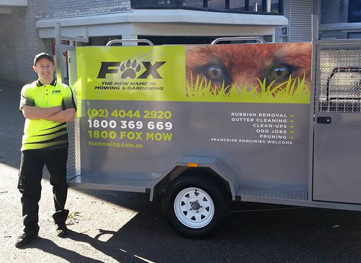 Just search for your local Fox Mowing professional and we will come to you and provide you with a FREE QUOTE. Our Lawn Mowing Woodberry service comes to you with quality and fully insured. Do not trust your property with just anyone. Come and see why so many of your close neighbours are already using us for lawn mowing and gardening in Woodberry. Fox Mowing and gardening Woodberry professional can do all your hard work around your property quickly, efficiently and at price to suit your pocket. All you need to do is contact us on the above number on this website or leave us your details on the attached quote form and one of our friendly team members will contact your local Woodberry Lawn Mowing or Gardening specialist to come and visit you ASAP. Most of our team that operate in the area have either grown up in Woodberry or have been working close by for a long time. This gives them great insight into the weather patterns and to be able to assist you with better knowledge and experience.